I've cast my vote, and believe me, this is one tough round. If the following rounds continue to showcase this kind of talent it's certain to be one tight race for the money. Vying for your votes is 30 year old Trevor Porter (no relation), one of Canada's top DH racers, and 16 year old Cameron McCaul, a rider I first saw at the Red Bull Freezride 2 weeks ago. This kid was going off in the competition, expect to see more of him in the future, whether he advances or not. A pair of fifteen year old BC boys round out the field with North Van's Trevor Chronister and Nanaimo's Neil Meier amply stepping up to the plate. There you have it, all are more than worthy competitors, it comes down to your votes. You've got just 7 days to cast before the next round! Making successful mountain bike videos is a difficult endeavor. One of the most difficult aspects is securing and licensing the music. It costs a lot of money and it is very time consuming. Wanting to avoid those difficulties, I decided during preproduction of JIB that I would write the entire soundtrack myself. they may lose access to trails they have ridden for decades. Ever watched a video and thought, "man, who did the friggin casting, I could have done a hell of a lot better job?" - Most likely. Ever had a chance to vote on who you saw in the sequel? - Probably not. Finally, here's your chance to take part! Phreemedia, Planet-X Bikes, Go-Ride.com, Lizard Skins and Pinkbike.com bring you the chance to choose who goes and who stays behind. This year at the Vancouver Outdoor Adventure Show there was a distinct lack of bike manufacturers. There wasn’t much eye candy to drool over, but if you looked hard enough to where the bike zone bordered aqua-land, tucked away in a corner there was a tiny booth that contained a big project. Arai Global Team back for 2003! COP's Biker Cross on Video! There's something about shuttling up a ski hill behind a skidoo in minus fifteen degree weather that breeds a spirit of comradery rather than competitiveness. 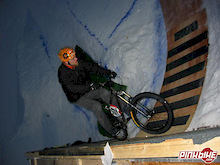 Sunday night was a cold one, but that didn't stop over sixty riders from competing in C.O.P. 's second of this winter's three Biker Cross races. This time the course offered some new challenges, the most notable a hard left after the final booter. 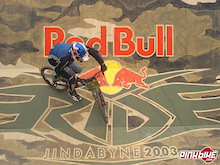 The Oceania Mountain Bike Championships took place recently at Eildon in Victoria on February 22-23, 2003. Essentially it was a challenge between Australia and that other country across the ditch, New Zealand. A bit of friendly rivalry between neighbours if you like. The exciting sport of Bicycle Polo!! If you are looking for something different to do with your mountain bike or your cruiser, try looking at polo for the people…bike polo. If you do, here is what you will find and what you won’t find. Yeti Cycles announced last week they will be the exclusive bike sponsor of the Canadian based Flowriders for the 2003 season. Headed up by legendary Flowrider, Dan Cowan (better known as Dangerous Dan), the team has been a hotbed of young talent in the North Shore freeride scene since 1997 and has helped the movement gain worldwide prominence. LAGUNA BEACH, CA-- Building on the momentum and growing popularity of its OutDoor Demo, Interbike today announced a change in venue for the hands-on cycling event. 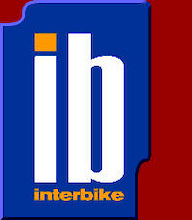 Slated for October 11th, 2003, the Interbike OutDoor Demo will be hosted in Bootleg Canyon, Boulder City, Nevada - located 23 miles southeast of Las Vegas and overlooking Lake Mead. David Vasquez wins Siemens Mobile Snow King! Today on the icy slopes in Garmisch, Germany, immediately after Marco Buechel of Liechtenstein won the FIS Super G World Cup, 15 of some of the world's best mountain bikers took to the slopes and raced in the inaugural Siemens Mobile Snow King event. Broadcast live on the German national network ARD and shown to many more countries around the world, the Snow King is essentially a massed start downhill for the 15 riders, on the 2.8km FIS course, descending 700m to the finish. Riders used tyres with spikes and chased 10,000 Euros in prize money. Left with a void since Java Cycle closed its doors late last year, Kamloops BC has filled that void with the Bicycle Cafe. Conveniently located at the bottom of Rose Hill, the Bicycle Cafe offers Kona and Santa Cruz bikes and a full-on service centre. Call 250-828-BIKE for more information or just drop in and say hi to Cheryl and the gang if you're in the neighbourhood. Due to cold temperatures and an unheated building, the Airdrie BMX Association has cancelled tomorrow's race at the Didsbury indoor track. Next race is scheduled for March 1, 2003. Our contacts at Kicking Horse Mountain Resort have recently leaked word that the hill may discontinue their mountain bike program for 2003. This is a huge blow to those of us who spent much of last summer riding the gondola to access KHMR's 3800 vertical feet of mindblowing trails. 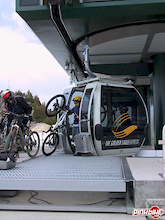 After a disappointing season, the resort's management is less than stoked on mountain biking's potential but there's still time to save the season. Race Face Performance Products is proud to announce the selection process for the second annual Ultimate Freeride Challenge has been completed. Last year's contest was a resounding success with the eventual winner being Tyler "Super T" Klassen. 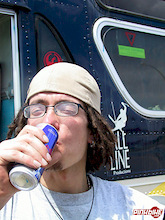 Klassen went onto fame and fortune in 2002 by winning the Red Bull Rampage in Utah, and starring in several high-profile mountain bike films. Well... this is to all the sorry suckers who have to watch what went down at the 2003 Red Bull Freezride on new videos and in the pages of your favourite magazine. This is the behind the scene story that just gets better until the climax on Saturday night that resulted in the crowning of Timo Pritzl and Aaron Kempf as the overall kings. Dropin DVD - it's here! The long awaited limited run DVD set of the Dropin TV season 1 is here. Over 7 hours of awesome rippin' action which includes all 13 episodes plus 1 hour of unseen out takes and footage that could not be shown on public television! This set comes on 3 DVD discs! Four new shirts are now available in the Pinkbike store. We have a new line of DeadSailor shirts for all the dirt jumpers and also another HardTail Pride shirt. The long awaited Dropin Season 1 limited DVD will be available this week! One of the most inventive free-ride mountain bike events, Red Bull Freezride, went down this weekend at Big Mountain Resort in Whitefish, Montana. Celebrating its second year, Red Bull Freezride combines the elements of free-ride mountain biking and technical park riding in a snow- and ice-covered environment. Reminder: COP's Biker-X Goes Tonight! After last month's break from the cold snap it's time for all of us to head out in the bitter cold to race in the 2nd race of Canada Olympic Park's 2003 Biker-X series. Registration is just $12 and runs from 5:30-6:30 and racing begins at 7pm sharp. Here's your chance to bang elbows in the terrain park, with only 2 more races this season, you won't want to miss it! bolstered with a couple of new Eastern DH rippers, Hugo Donais and Louis-Philippe Leonard. coming Jurior based in Whistler. Red Bull Race Down Results. KONAWORLD(Feb. 11, 2003) – Kona Bicycles today announced that they have signed veteran professional freeride phenom Dave Watson to the Kona Clump team of competitive out-of-bounds riders. Dave will be riding Kona’s Stinky Dee-Lux and Stab Primos for the 2003 season. 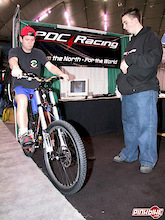 Come on out to the Advil Outdoor Adventure Show to see all that’s happening in the mountain bike world this year. This is the show. Search out the pinkbike.com booth to find a sweet set up including Dylan Tremblay, Darren Butler and all your Drop in needs. Also at the show, the premiere and release of the 3 Disc DVD set of season 1 of Dropin. Over 10 hours of riding and footage from the season that could not be shown on TV. 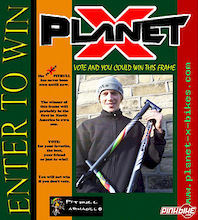 Planet-X, 2003 official sponsors of the Trialskings. 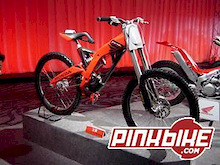 in trials, Planet-X are the 2003 sponsors of the Trialskings! Two solid days into it, the course is really starting to take shape. Skinnies weave their way off the snow and into the trees. A 10 foot high wall ride is now mounted firmly on the judges tower. Once the largest feature on the course, the Freezride bus is now dwarfed by the loop, the 100 foot Benjamin Franklin gap and the 6 pack. Mike Kinrade and Shawn Denny of Drop In spent the day shaving and preparing the transitions. Most of the snow will be moved by tomorrow morning and the athletes arriving by the moment will acquaint themselves with the course by shaping its features. Doug Fink arrived tonight and he promises to shoot many photos for you early tomorrow. Check back around lunchtime tomorrow for more. I arrived in Whitedfish late Sunday afternoon and the course was slowly beginning to take shape. Rough sketches on sheets of cardboard and in the snow showed stunts, jumps, hips and all kinds of crazy contraptions that together will form the 2003 Freezride course. This year's course will showcase many different riding styles with big hits, skatepark features, wall rides, huge gaps, BMX-style jumps, North Shore skinnies, and even some stairs and rails. A field of 54 riders includes 18 of the world's best riding against a stellar, deep field of 36 amateur riders. The pros are vying for cash and a sweet Honda XR50 fully pimped by the gang at SCS racing while the amateurs get a chance to win a decked out Ambulance complete with killer stereo. I'll get some photos and maybe a start list up tomorrow as the event begins to take shape. For now, suffice it to say, things have been stepped up somewhat for 2003! 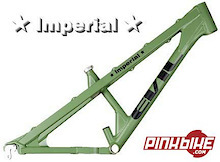 The next run of Imperial frames are scheduled to be in our warehouse by April 15th. For this run, we'll be offering our traditional colors (white, brown, black, and green), and we'll also be debuting a few new colors: Blood Red (with "burnt-edge" bone colored decals), Light Blue (with cream colored decals) and Metallic Orange (with silver decals). As usual, these frames will probably sell out before we even have them in stock, so get in touch with us ASAP to reserve your frame. Why Should Boys Have All the Fun ? Tioga Bicycle Components and Orange Mountain Bikes proudly announce the formation of the Tioga Orange Factory Racing Professional Mountain Bike Team. This Southern California based team will contest the entire professional North American race series, including the Sea Otter Classic, the NORBA National Series, and the World Cup rounds held in North America. With a group of young, talented , International riders, the Tioga Orange team will be competing in Downhill and Mountain Cross events throughout the season. Dropin Season 2 - Get on the bus! The search for riders for season 2 of Dropin has started. We are looking for Guest and a couple more Full Time riders for Dropin filming this summer. This is your chance to Get On the Bus! 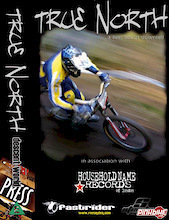 Descent-World.co.uk's first foray into the mountainbike video world, True North, has been selected for the Exposed Freesports Film Weekend held in London, UK on March 14-16. This stellar flick will be screened alongside surf, skate, BMX, and Base-Jumping films along with the popular Sprung videos. If this festival is anything like the Banff Mountain Film festival, it's something you don't want to miss. Not only do you get to see some unbelivable filmmaking, you do it while hanging with the makers of those films! On their Japanese web site, motorsports powerhouse, Honda announced the creation of Team G-Cross Honda. Details are sketchy at the moment, but it looks as though the team will ride an internally geared, single-pivot bike using Kayaba Suspension (front and rear) and Akebono Disc brakes. Naoki Idegawa, formerly of the Arai/Global Team is their marquee rider and he'll be contesting the Japanese and World Cup series. From what I can see in these pictures, the bike is radically different from anything we've seen before. With Honda's penchant for technology, this could quite conceivably change the bike forever. Then again, it could crash and burn. so we encourage everyone to attend the meeting to have their voices heard. 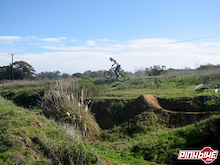 Freeriding/ Dirt jumping will be a major topic for discussion so don't miss out. 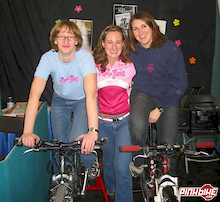 Phreemedia.com, the makers of Union, have offered Pinkbike's readers the chance to decide who you'll see in their 2003 release, Re-Union. In the upcoming days, we'll go online with voting. You'll be choosing five riders to join the film crew as they take a 2 month tour of the UK, France, Italy, Switzerland, Austria, the Czech Republic, and Poland. There's an impressive talent pool with the likes of Tyler "Super T" Klassen, Von "V-Dub" Williams, the Houseman Brothers, "Krispy" Baughman and many more all vying for your votes. explicit directions, please contact Kent Setsma at fffoes@yahoo.com. 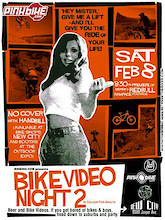 A mountain bike-only night and World premier of the movie Chain Reaction 4 will be held at Rye Airfield on March 8th, 2003 as a benefit to raise money for the New England Mountain Bike Association’s (NEMBA) Land Preservation Fund. 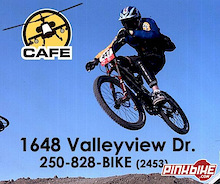 There will be giveaways, raffles, free food, and demos by pro mountain bikers. Proceeds of this event will go toward the purchase of 47 acres in “Vietnam”, a popular New England riding destination that is under threat of development. On February 20th Idun Clothing is hosting a riders’ night at Red’s. It is going to be an all ages show, and we’ll be screening the new Idun video, “Monkeystyle” (the full version, not he promo that’s been floating around the stores. We’ll also, hopefully, be screening a few more videos, but I’ll have more details to come on that one. I’ve got an ample supply of prizes from our warehouse, and a few other companies have been gracious enough to throw some swag our way. Tickets are just $6, with all proceeds going to Sports Central, an Edmonton-based charity that hooks disadvantaged kids up with sports gear, so this is going to be a fun night for a good cause. Tickets are now on sale at most Edmonton-area bike shops, and we’ll be selling tickets at the Edmonton Outdoor Show from Feb 7-9. See some cool footage from the Redbull Rampage that happened in Utah a few months ago. Derek will premiering his 7 minute film at 8:30 up stairs in the Lounge. Whether it's on the race course, dirt jumps, skate park, BMX track or on a motorcycle, Dustin Adams has some mad skills. In a season that wasn't supposed to happen, Dustin became Canada's National Champion, finished 3rd overall in the NORBA series, garnered a 4th place finish at the Durango World Cup, in addition to winning Velonews' Comeback of the Year and Canadian Cyclist's Reader's Choice Awards. I recently caught up to Canada's future in downhilling and spoke to him about the 2002 season and what's in store for the future. We will select a grand prize winner for a Norco 125 compete bike in week 13 of the contest. Episode 7 - Golden is currently online and available for download. 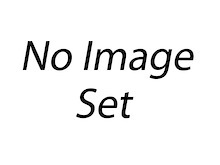 (RIGHT click on the link, and save target as)NOTE: If you are having a problem downloading on the same day that the video comes out it is due to the 1000s of users trying to do this at the same time. The video server connection can get saturated. “This is the best course I've ever ridden on for a freeride competition," said 18-year-old world renowned Canadian bike prodigy Thomas Vanderham. "The whole thing is just awesome." Among the bruised egos, broken-in-half bikes and bravado on display at the world's toughest freeride event - held in Jindabyne, NSW, Australia, on the toughest mountain bike course ever created - Western Australia's reigning 17-year-old World Junior Champion Sam Hill made the day his own.